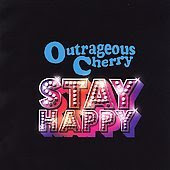 Stay Right Here a Little While...: OUTRAGEOUS CHERRY: "STAY HAPPY"
Outrageous Cherry are a great retro psych rock band that has been around since 1994 or so. Their sound is a cross between downer hazy sweet psychedelic pop, heavy space rock a la Hawkwind, and high-gloss 1970's glam. Their music can be deceptively innocent...with almost a Beach Boys "Pet Sounds"era vibe mixed with the feeling of having taken one too many trips and you are staring into the abyss trying not to fall in. Their latest album, "Stay Happy"(2006), strays away from the blistering space rock of a few of their previous efforts. It is a masterpiece of straight 1960's psych pop and 1970's glam. The vocals are detached and the lyrics are as cynical and paranoid as ever. The songs have that glossy, hazy, smoke-filled 1970's feel, and some bring to mind the work of "Slider" era T-Rex especially "Solid Sound Gangster". There's not a weak track on here. Highly recommended. Here's two tracks from "Stay Happy". "Solid Sound Gangster" and "New Creature". Enjoy!